The Latin words seen here, “Sic transit gloria mundi - So passeth the glory of the world”, formerly figured very prominently in the Papal coronation rite. 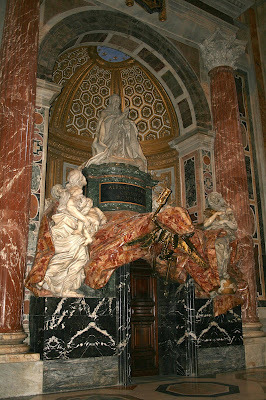 After the ceremony, the Cardinal Protodeacon approached the new Pope as he was carried through St Peter’s on the sedia gestatoria, and saying these words, would light a wick of flax on the top of a reed; this would burn away very quickly, just as the glory and power of the world pass away very quickly. Readers who are familiar with the churches of Rome will recognize this motif from the two most prominent churches dedicated to the first Pope. 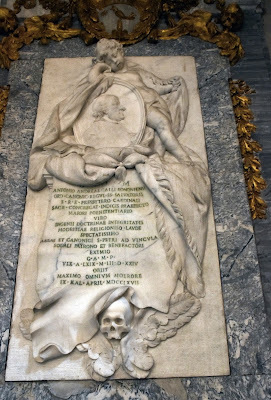 At the Vatican, Bernini’s monument to Pope Alexander VII Chigi (1655-67), who was a personal friend of the artist, shows death itself as a winged skeleton holding an hourglass. The curtain covering his face reminds us, like the stained glass windows above, that death is no respecter of persons. Image from Wikimedia Commons by Jean-Pol Grandmont. and the monument of Antonio Galli (1697-1767), Cardinal Priest of the church 1757 until his death, and a member of the Canons Regular of the Most Holy Savior of the Lateran, who still run the church to this day.